COVER: Backgammon, king of games and game of kings, is one of the world's oldest and most fascinating contests of skill and chance. For 5000 recorded years it has been the sport of emperors, enthralling all who have played it, from Antony and Cleopatra to Montezuma, from the English monarchs at court to the jetset at home in their smart international casinos. In ancient Rome backgammon rivalled even the Circus Maximus and the Collosseum as a provider of leisure pastime. The Emperor Claudius wrote a book on the subject, and it is well known that Domitian was an expert at it and Caligula a cheat. For some it was the equivalent of strip poker, and others, including Nero, gambled on it for gigantic stakes. Backgammon is as accessible as the reverse side of most chessboards, when used in combination with dice, a doubling block and two sets of fifteen men. Actually it is as simple to learn as poker, and infinitely more challenging, for this is one of the few games of luck and skill in which there is no concealment. Because of their infinite variety, no two games are ever alike, and a tie is virtually impossible. This clear and concise introduction contains everything that you need to know in order to play backgammon for fun or for money. 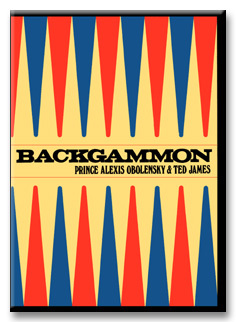 It includes the official rules of the International Backgammon Association, of which Prince Obolensky is a co-founder. This illustrated guide for both beginners and more advanced players is recognised by the world's backgammon experts as the leading book on the subject. AUTHORS: Prince Alexis Obolensky learned backgammon as a child in Istanbul after his family went there to escape the Russian Revolution. Co-founder of the International Backgammon Association, he is credited with having invented the first systematic method of teaching the game. Ted James is a journalist, and the author of many books.